Memphis Brew Coffee Shop, Memphis, Tenn.
It’s about time some one realized that college students and coffee go together like ribs and dry rub. Memphis Brew has been open for about a month just across the tracks from the U of M in an unassuming yellow building next to Baker Automotive. 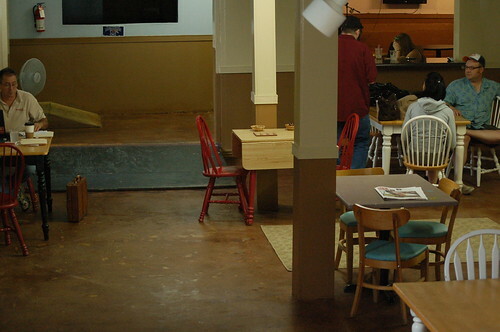 The massive space is divided into three parts: an entry way with comfortable couches, a large main room with the coffee bar, and a smaller room with a stage. It’s cozy, but seems a little unfinished. 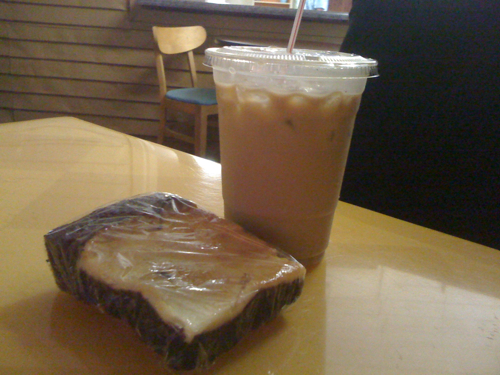 Inside Memphis Brew, Memphis, Tenn.
At the barista’s recommendation, I tried the cold brew (iced coffee with milk and an optional flavor shot) and a ricotta cheese brownie. The brownie was chewy and delicious, but insanely rich. I was told that it had espresso in it, so don’t be surprised if you get a little buzz from your baked goods. Memphis Brew is open seven days a week. Sunday – Thursday, they’re open until 1 a.m., and they stay open until 2 a.m. on Friday and Saturday (making them one of the only coffee shops in town that’s open late on week nights). Every Thursday night, there’s an open mic night that starts at 9 p.m. Score! I can’t wait to try it out! Do you know if they have free wi-fi to sweeten the deal? It’s about time we get another coffee shop that is open late hours! Is it comfortable to hang out in? The chairs in the picture look kinda meh. It’s pretty comfortable – there are a bunch of couches and comfy chairs scattered around. 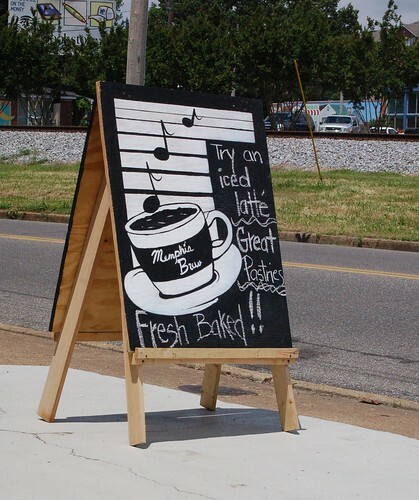 Memphis Brew offers a little bit of everything, free WI-FI, great homemade goodies, games and a place to call your second home. I stumbled across this post and it made me so happy to see because this is my mother’s store! The ambience will only continue to be enhanced with every person who walks through the doors, gives it a chance and leaves their mark. That’s just the kind of place it is. That’s their goal. Free WiFi doesn’t hurt either. I know it is going to keep growing and building every day due to people in the area realizing its potential to be one of Memphis’s signature spots. Please go support them! Thanks! For some reason I can not see that being as true. The two owners are so nice and accepting of everyone that comes into the shop. It is so nice to walk in and they know your name and have your drink ready to go. I was in Memphis Brew the other day and they have art on the walls from a couple of different local artists. Maybe something got misconstrued, because I honestly can not believe that those 2 ladies would do anything of the sort. Also, not only are their brownies awesome, but their chess squares are out of this world!! And with a plain ol cup of joe…delicious! if this is who i think it is, then i know for a fact that you only had to pay for items from the coffeeshop a handful of times. noone was wronged by anyone at the shop, and slandering the owners over the internet isn’t gonna do anybody any good. it’s funny that you left out the part where you and your buddies came in threatening the owners of this establishment with “muscle”. you also neglected to mention that the artist in question offended many customers with his art. anyone is welcome at the memphis brew, especially artists. we would honestly like to have more art adorning our walls from all the wonderful memphis locals that are out there. Kuddos to Memphis Brew! Remember to vote for them in the new: http://www.memphisflyer.com/BOM2010/archives/2010/07/12/vote-here !!! Can you tell me who will be playing Saturday night (July 31st) and what time? Thanks! I love this place. I go there on the weekends to study. It’s quiet and there’s always plenty of room. Diana is always so nice and friendly, not like other snotty hipster coffee shops that can get on your nerves sometimes. Their coffee is nice and smooth and their baked goods are out of this world. Always something different!